Exotic bird species are prominent members of urban avifaunas in many areas of the world, and much has been generalized about their distribution, abundance and undesirability in urban habitats. Less attention has been given to the spatial and functional responses of exotics to the urban environment. This study tests the hypothesis that exotic birds exhibit responses to environmental factors that are similar to those of local native birds. Exotics group with natives in generalist urban tolerant and specialized urban avoider assemblages, and their species richness and site similarity are broadly proportional with those of natives. 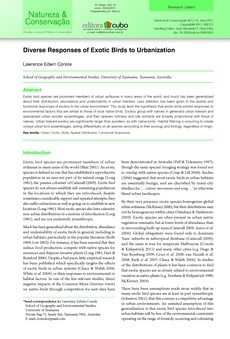 Urban tolerant exotics are significantly larger than avoiders, as with native birds. Habitat filtering is occurring to create unique urban bird assemblages, acting differentially on all species according to their ecology and biology, regardless of origin. Urban, Exotic, Birds, Spatial Distribution, Functional Responses.